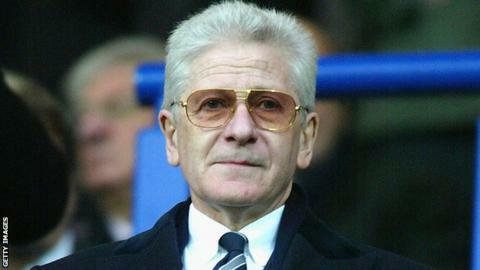 Former Bolton Wanderers owner and honorary president Eddie Davies has died aged 72, the club has confirmed. Davies' financial backing helped bankroll the Trotters' emergence in the Premier League during the 2000s. Players such as Jay-Jay Okocha, Youri Djorkaeff and Ivan Campo came to the club, who under then-boss Sam Allardyce also played in European competition. "The thoughts of all at the club are with his wife Sue, his family and friends," the club tweeted. Bolton-born Davies first joined the club's board of directors in 1999, before becoming the majority shareholder of Burnden Leisure four years later. "Without Ed's support we would be watching a very different standard of football," said the late former Wanderers chairman Phil Gartside when Davies took over in 2004. Davies only stepped down from his role when the club was bought by Sports Shield in 2016, with the former businessman writing off in the region of £175m worth of loans to allow the takeover to progress. Meanwhile, Wanderers are currently in danger of being placed in administration, the current chairman Ken Anderson has warned.